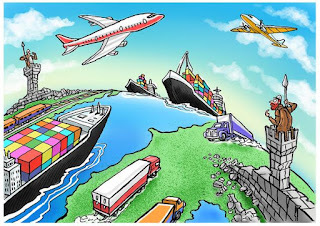 * This is my column in BusinessWorld on April 24, 2019. Earthquakes and volcanic eruptions are 100% part of the Philippines’ “geological DNA.” This is because we are in the “Pacific Ring of Fire” and our entire archipelago seems to have protruded from under the sea. Thus, if there were no “violent” volcanic activities, there would be no Philippines. 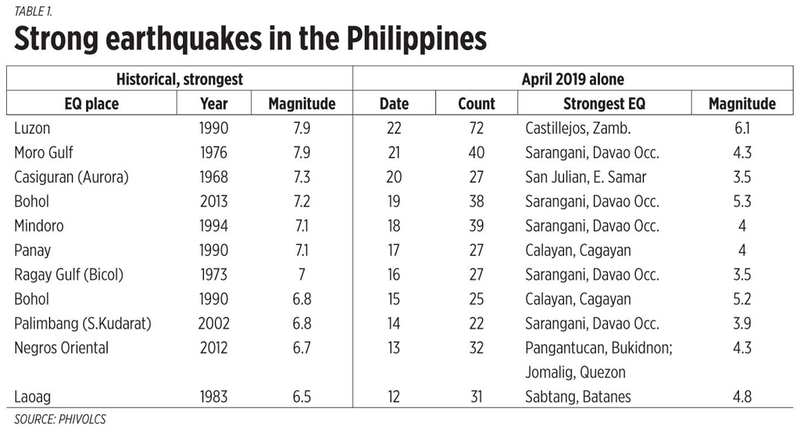 A strong earthquake with magnitude 6.1 rocked Zambales and neighboring provinces in Central Luzon plus Metro Manila last Monday, April 22. Many public and private structures were damaged, a few deaths and many injuries were recorded. That day, there were 72 earthquakes nationwide that occurred. But compared to previous earthquakes in the country, it was not that strong actually. On average we get about 30 earthquakes a day nationwide. Numbers for the past few days are shown (see table 1). 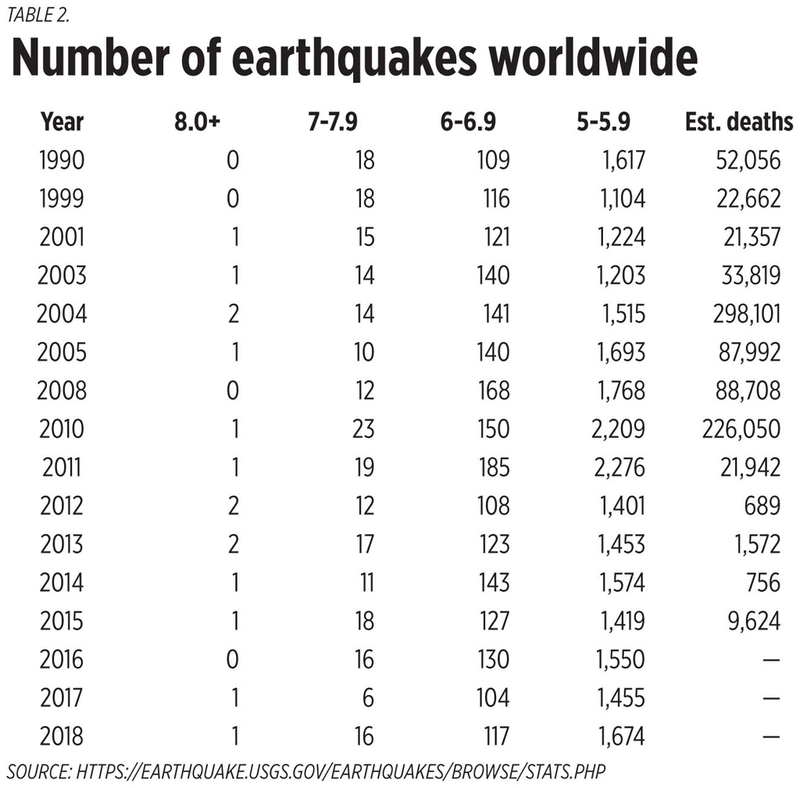 There are many alarmist claims here, with no scientific or historical basis, that the “Big One” (8.0 +) for the Philippines is coming soon and will lead to “tens of thousands of deaths.” Even earthquakes of 7-7.9 are still rare worldwide, the more common movements are in the 5-5.9 and lower. And note that after 2010, the number of estimated deaths globally from this disaster is declining (table 2). 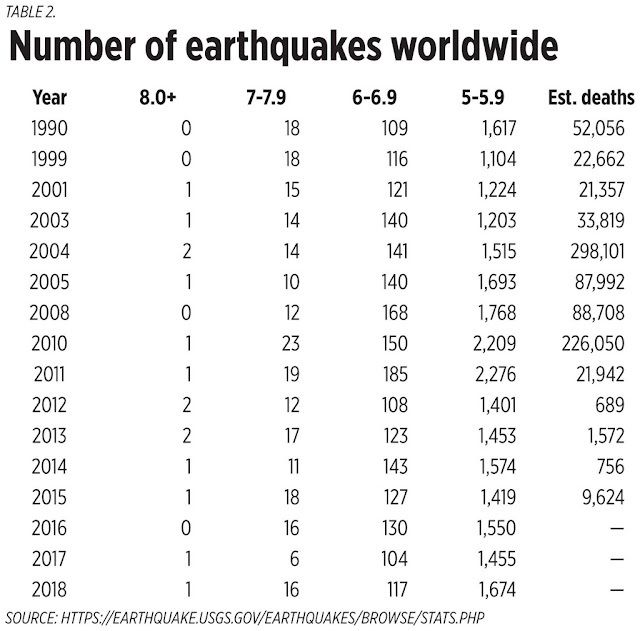 The main reason for this is that people now live in stronger structures, not because the number of earthquakes is declining. For the Philippines, the market-oriented reforms for efficiency (MORE) to deal with our geological reality is for government to reduce taxes in construction materials (especially steel and cement), do not invent new taxes and tariffs, and/or reduce real property tax for strong buildings and structures per sq.m. area. In short, reverse the taxation regime, let the people spend big on sturdy and strong buildings, save more lives and properties and people’s pockets. Then government need not worry much about people’s well-being when strong earthquakes occur and reoccur. Starting this month, the new Chairman of Hong Kong's only free market think tank, the Lion Rock Institute, is my friend Peter Wong. Above photo, with Fred Mcmahon of Fraser Institute (Canada) and Peter during the EFN Asia conference 2014 in Hong Kong. 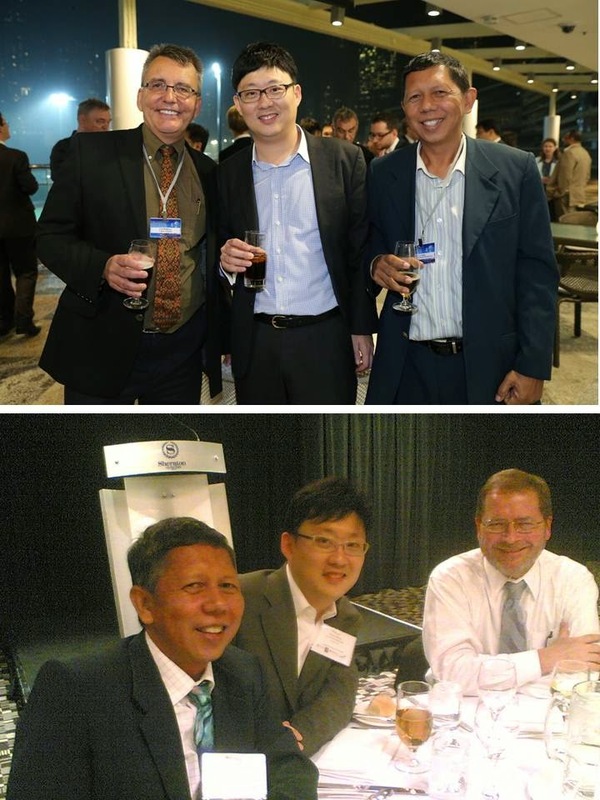 Lower photo, with Peter and Grover Norquist of the Americans for Tax Reforms (ATR) during the 4th Pacific Rim Policy Exchange 2010 in Sydney. Some people ask, "HK is already a free market economy, why do they need a free market institute?" Well, the quick answer is that HK is free marketer enough compared to most economies in the world but it is still under the political jurisdiction of the China communist government. And many of its policies are populist (freebies here and there) and regulations are rising. So I repost here Peter's message, enjoy. 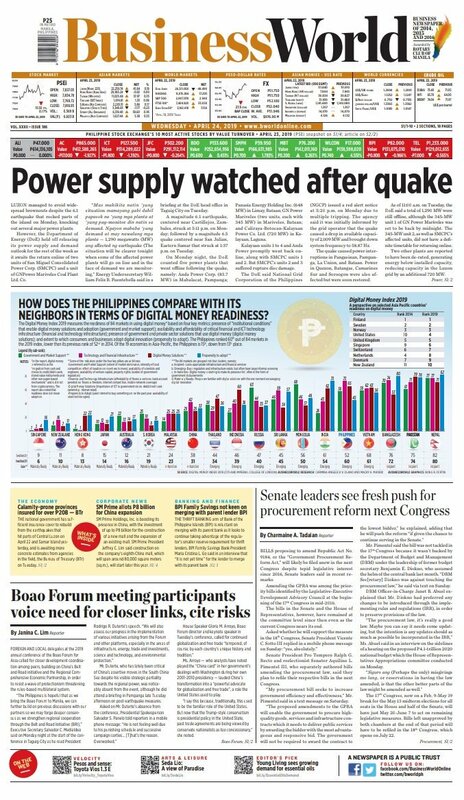 * This is my article in BusinessWorld on April 22, 2019. Rule of law means the law applies equally to unequal people, no one is exempted and no one can grant an exemption. Granting exemptions, say, in the law against stealing or murder automatically leads to the rule of men where the powerful and the mob are exempted from penalties for violating certain rules. The World Justice Project (WJP) produces an annual study, the “Rule of Law Index” (RoLI), and ranks countries based on their performance on 8 factors and 44 sub-factors. The RoLI 2017-2018 Report involved more than 110,000 households as respondents and 3,000 expert surveyors in 113 countries and jurisdictions, whereas the RoLI 2019 involved more than 120,000 households and 3,800 surveyors in 126 countries and jurisdictions. Bad news #1 is that the Philippines’ global ranking has been deteriorating. From 51st in the RoLI 2015 Report, it is already down to 90th in the RoLI 2019 Report. 4.2 The right to life and security of the person is effectively guaranteed. 4.3 Due process of the law and rights of the accused. 8.3 Correctional system is effective in reducing criminal behavior. 8.4 Criminal system is impartial. Now comes bad news #2: in this coming May 2019 Senatorial elections, many of those in the Top 12 based on the SWS March 2019 survey may worsen the rule of law in the country if elected. On the other hand, the Otso-Diretso team has a good line up of human rights advocates (Chel Diokno, Gary Alejano, Erin Tañada, Samira Gutoc, Bam Aquino), experts in electoral and international law (Romy Macalintal, Florin Hilbay) and entrepreneurship (Mar Roxas). I wish that many of them will win but many are not in the Top 12, not even in the Top 18. Independent candidate and former senator Serge Osmeña is another good candidate who should win but is not among the Top 12 in the recent surveys. A number of recent legislations under the Duterte administration are violations of the rule of law. Like the free tuition in all state universities. If the state should give education subsidy, it should apply this to all tertiary students and not exclude those in private universities. A pre-requisite market-oriented reforms for efficiency (MORE) in this case is for senatorial candidates with high respect for the rule of law to win. Further deterioration of the Philippines’ ranking, even a standstill in RoLI, is bad news. 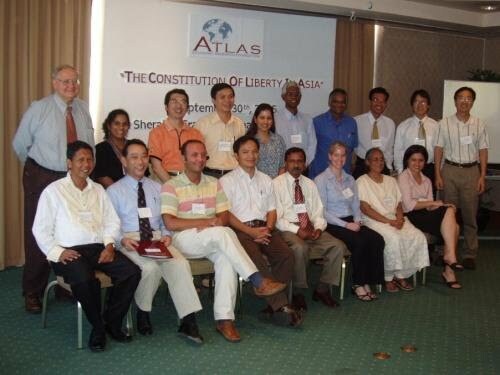 The first Asia Liberty Forum (ALF) by Atlas was held in October 2004 in Hong Kong and it was originally titled "Asia Resource Bank Meeting" (ARBM). It was a two-days conference that preceded the two-days and bigger Economic Freedom Network (EFN) Asia conference, mainly sponsored by the Friedrich Naumann Foundation (FNF). The ARBM was a joint project of the Atlas Economic Research Foundation (now simply Atlas Network) and FNF. In 2005, the Atlas-FNF event was downscaled to a small group one-day RTD on the book of Friedrich Hayek, "The Constitution of Liberty" (1960). It also preceded the two-days EFN Asia conference held in Phuket, Thailand. In 2006, the Atlas-FNF event was called the "Asia Liberty Forum", it was back to a bigger, one-day conference and again, preceded EFN Asia conference 2006, held in Kuala Lumpur. 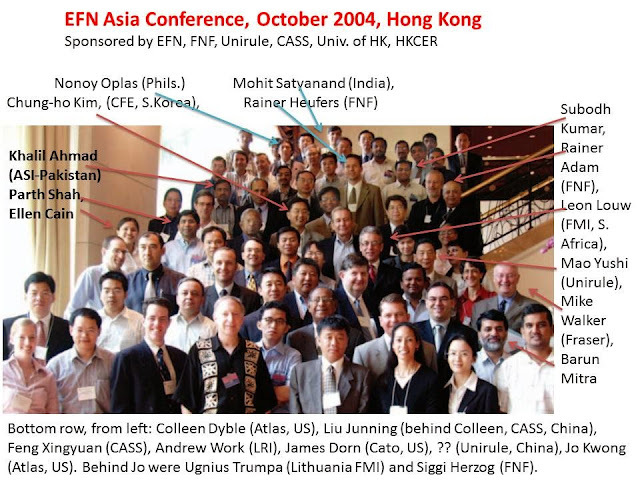 In 2007, Atlas stopped co-sponsoring the ALF, so it was the regular EFN Asia conference 2007. I think it was held in Cambodia. I just wanted to let you know that Atlas is making some revisions in its program schedule this year. One of the big changes it that we will not be hosting an Asian Liberty Forum this year. After three successful years of partnering with the Friedrich Naumann Foundation to hold our Asian Liberty Forum in conjunction with their annual Economic Freedom Network meeting, Atlas has decided to move onto other programs for the moment. As you know, Atlas began working with FNF to develop this Forum as a way to cultivate and expand the free market think tank network in Asia and to serve as a catalyst in helping it to get it to the point where it was able to thrive with limited assistance from Atlas. After three fruitful meetings in Hong Kong, Phuket and Kuala Lumpur, Atlas has been very pleased to see significant growth in the number of new contacts from across Asia and is confident that the Asian network is now able to harness its internal leadership and momentum to develop its own networking meetings. Of course, if one of you decides to host a future Asian Liberty Forum, let me know so we can explore potential opportunities to collaborate. Atlas remains very interested in continuing to be involved in your efforts and to provide opportunities for you to get together with donors and others in the network to share ideas and collaborate on projects...."
I wrote to Colleen saying that somehow I had a feeling that the annual ALF will come to an end, and it has become true. I thanked her and Jo Kwong. In May 2007, the Americans for Tax Reforms (ATR), its partner Property Rights Alliance (PRA), International Policy Network (IPN, UK) and four other institutes jointly sponsored the first Pacific Rim Policy Exchange (PRPX) held in Honolulu, Hawaii. June 2008, the second PRPX was held in Hong Kong. The participation of Asian free market think tanks in Honolulu was small -- difficult to get US visa, expensive to go to Hawaii, etc. So for the 2nd conference, it was held in HK, mainly to attract more think tanks and business orgs from Asia to attend. This month marked my 15th year involvement in the free market movement. It started when an Atlas staff in the US, Priscilla Tacujan, met me in February or March 2004 in Manila and recommended me to be one of two international fellows from the Philippines (the other one was Ellen Cain of FEF) to undergo one-month training and meetings in the US. So around mid-2004, I and Ellen went to Midland, Michigan, to attend the Mackinac Leadership Conference. Mackinac President that time was Larry Reed. From Michigan we went to Chicago to attend the Atlas Liberty Forum 2004, also the Heritage Foundation's annual Resource Bank Meeting. Those were my first exposure to the free market movement. Prior to that, I never knew anyone outside the Philippines who were free marketers. And I also met Jo Kwong, then Atlas VP for Institute Relations. Jo is cool, aside from the fact that she's an Asian-American. It was Jo who recommended me to participate in ALF 2004-2006. Then Jo also granted me a travel scholarship to attend the Atlas Liberty Forum 2008 in Atlanta, Georgia, then the Atlas Liberty Forum 2009 (around March) in Los Angeles, California. And finally the Atlas "Tear down the wall" big conference in NYC in November 2009. In 2010, Jo resigned from Atlas. I also received zero travel grant from Atlas ever since. Perhaps the new team disliked me, hehehe. No problem because other institutes and groups appreciated what I was doing here in Manila and they invited me to various regional and global seminars, meetings. Like the FNF, IPN, ATR, PRA, Heartland, IDEAS, WTA, Lion Rock, Geneva Network, etc. Thank you guys. Exactly four years today that I have been a contributor/columnist in BusinessWorld, the Philippines' premier business newspaper, about 32 years old. I started with Weekender then Opinion sections. Three guys helped me -- my former editor in interaksyon.com, Arnold Tenorio, then Weekender (now Opinion) editor Ricky Torre, and Boojie Basilio (resigned Opinion editor). BWorld editor in chief Roby Alampay agreed of course when Ricky and Boojie accepted my regular contributions. Thank you for the continuing trust, BusinessWorld. * This is my column in BusinessWorld on April 17, 2019. Unlike physical property which is tangible, intellectual property rights (IPR) are intangible, like copyrights of songs, patents of newly invented medicine molecules, trademarks of known brands, and trade secrets. Thus, public appreciation of IPR protection is not as high as physical property protection. 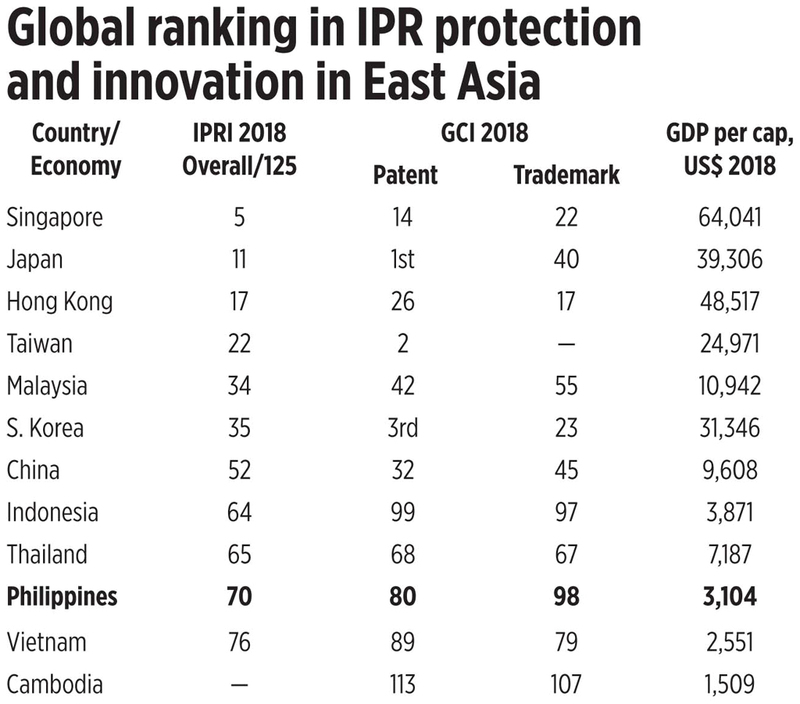 Compared to neighbors in the region, the Philippines ranks low in IPR protection in certain international reports. Numbers below are from three sources: (1) Property Rights Alliance’s (PRA, US) International Property Rights Index (IPRI) 2018 Report, (2) World Economic Forum’s (WEF) Global Competitiveness Index (GCI) 2018 report, and (3) IMF’s World Economic Outlook (WEO) 2019. 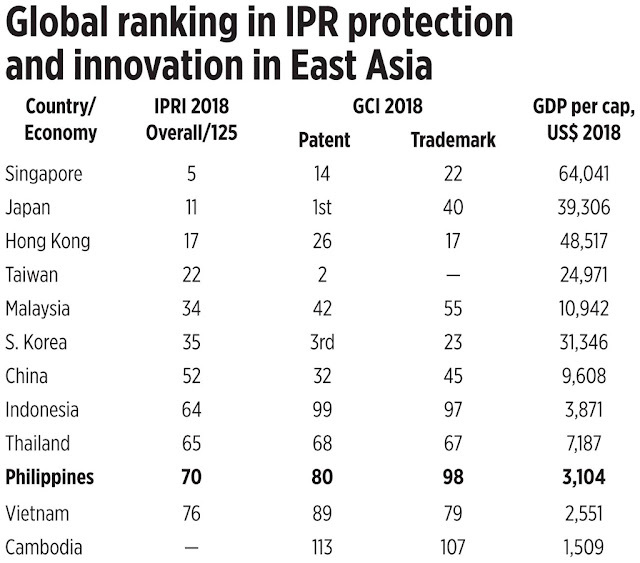 Notice the top seven countries and economies — they have higher global ranking in property rights protection (out of 125 countries), also in Patent and Trademark per million population ranking (out of 140 countries), and higher per capita income of at least $9,600 in 2018. Middle of next month, the Geneva Network (UK) will hold a one-day seminar and meeting of some Asian free market think tanks and academics about IPR protection and trade to be held in Kuala Lumpur. And a week after, PRA (US) will hold a side event on IPR and investment promotion in Sydney during the bigger event, the 17th meeting of the World Taxpayers Association (WTA) conference. IPR issues often crop up in public health policy debates. Like the continuing push in some Asian countries for compulsory licensing (CL) of newly invented drug molecules that are successful in controlling certain diseases. These are very expensive drugs to develop (many stages of clinical trials involving thousands of patients) and yet governments with the implicit aid of the WHO will quickly confiscate the patent and allow mass production by local generic manufacturers. This pours cold water on further medicines innovation that can help control existing and emerging diseases. Then there are trademark-busting policies like plain packaging of certain products deemed “unhealthy” like tobacco, soda and sugary foods. Abolition of the many elaborate branding by competing companies and forcing only one generic packaging will make counterfeiting of these products so much easier. When cheap counterfeits come in, they will encourage, not discourage, more consumption of “unhealthy” products. The “law of unintended consequences” often kicks in when the sanctity of private property is disregarded. The market-oriented reforms for efficiency (MORE) to promote public health, entice more investments and generate higher per capita income are also aimed at further protecting private property, physical or intellectual, not dishonor them. In early November 2006, I suggested to some Asian free market friends the formation of an Asian Free Marketers Alliance (AFMA), or an Asian Free Market Forum (AFMF). These were my thoughts then. This image I got from a WSJ graphics, "the United States of Trade." The statists, politicians and bureaucrats in our continent and the rest of the world have their own formal alliances or associations, why can't free marketer groups and institutes form their own, especially in our continent? Groups like APEC, ASEAN (now ASEAN + 6), ASEM (Asia-Europe Meeting), blocs within WTO, UN, etc., they have annual or bi-annual meetings. The politicians are spending our tax money for their expensive summit and meetings, and they decide how much trade and economic liberalization they can give or deny us. So, why don't we form our own alliance? A formal alliance? Currently we are loosely connected through Atlas' Asian Liberty Forum, or some regional and international conferences and meetings where we bump onto each other. 2) it will have a board, and rotating presidency (say 1 term for a year). 3) contribution from each institute, or we'll ask "foreign aid" from Atlas or FNF or other big foundations to support a very lean regional secretariat office. i) a coordinated campaign to pressure Asian governments and trade negotiators in the WTO for some unilateral trade liberalization. ii) humanitarian campaign against persecuted free marketer individuals anywhere in Asia. One reason why I have thought of this is because the Philippines will host the 12th ASEAN summit this coming December. It is now regularly called "ASEAN + 6" summit – the 10 members of ASEAN + China, Japan, s. Korea, India, Australia, New Zealand. And those summits are never cheap. They cost taxpayers of the host countries several million $ for their two-days summit, plus several days Ministerial summit on certain issues. So I thought there is a need for a more coordinated alliance of free marketer guys and institutes from our continent, to issue at least 1 or 2 position papers, say on international trade and taxes (or migration, health, environment, etc. ), that we shall raise during the ASEAN + 8 summit next month. We can disseminate our position papers to media, not only in the Phils. but in your respective countries as well. loud "Asian Liberty Forum", which can possibly evolve to a "World Liberty Forum" -- in contrast with the various fora by the statists and politicians -- UN, WB-IMF joint meeting, APEC, WEF, WSF, and many others. Again, these were my thoughts in November 2006. We were not able to push it though. Just posting them here to retrace my thoughts more than a decade ago. * This is my column in BusinessWorld last week, April 15, 2019. After the water shortage in many areas in Metro Manila last March, next is power shortage and brownouts in many areas of Luzon including Metro Manila this month. Yellow alerts (insufficient and thin reserves) were issued early this month due to high electricity demand and unplanned, unscheduled outages of several power plants (boiler tube leak, piping leak, boiler slagging, other causes). Red alert (insufficient supply) was issued last Friday, April 12, and many areas in Luzon including Metro Manila experienced a 1-3-hours rotating power interruption. 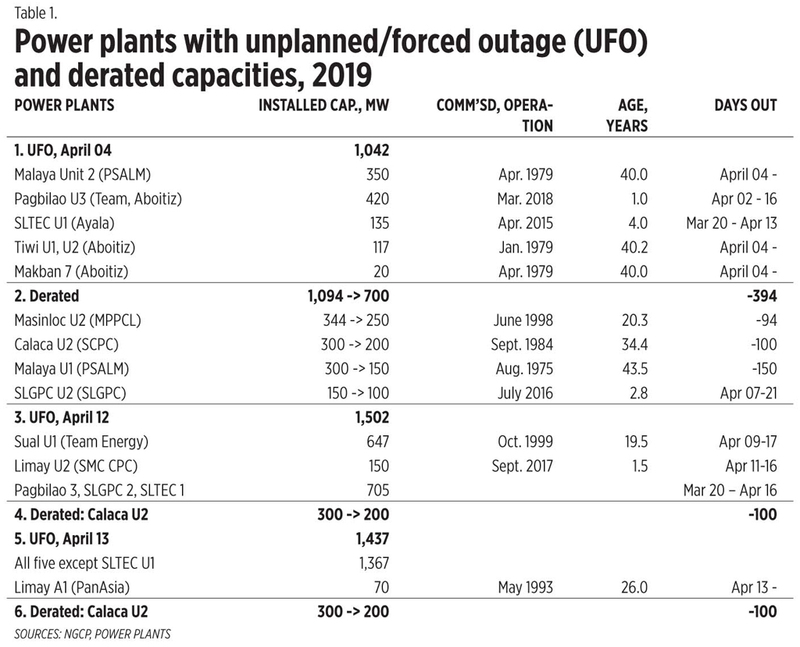 Below are the affected power plants, their commissioned/operation years and affected days. 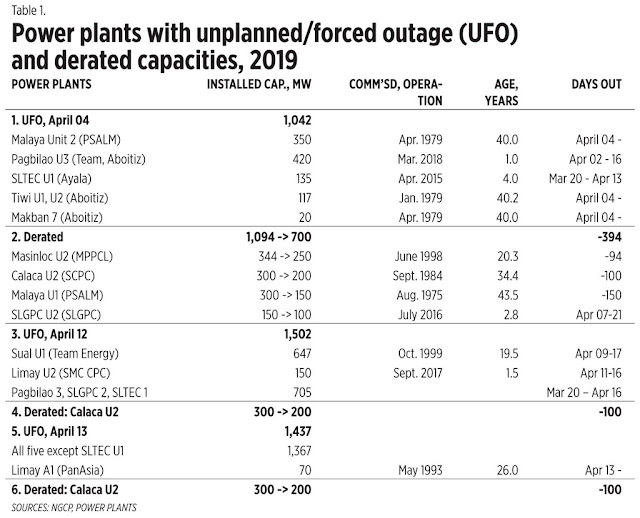 Note that of the 11 power plants mentioned above, seven are above 19 years old, especially the huge Sual, Pagbilao, Masinloc and Calaca coal plants, and Malaya oil plant. Many of our big power plants are old, especially the geothermal, oil and hydro plants: 74% of these plants in the Luzon grid are 15 years or older. Which makes them more prone to UFOs. The Market-oriented reforms for efficiency (MORE) needed are to have more new power plants, especially the conventionals. We should depoliticize the approval process of many power supply agreements or PSAs (about 5,000 MW) that are languishing at the Energy Regulatory Commission (ERC). Last April 2, I participated in a roundtable discussion on “Challenges to the Philippines power sector” organized by the Arangkada Philippines Project (TAPP). Among the debate points was whether the Philippines has enough or insufficient generation capacity both in the short- and medium-term. The series of yellow and red alerts early this month seems to suggest that there is indeed insufficient supply of stable power. Attention, the following agencies and groups: (1) ERC, please hasten the approval process of new power plants’ PSAs. (2) Various agencies, please control your bureaucratism and hasten the permitting process of new power plants, DOE can use the new EVOSS law for this. And (3) environmentalist NGOs and anti-fossil fuel groups, you are barking at the wrong tree. Frequent brownouts will force the people to use the really non-clean power sources — candles for the poor and gensets for the rich and middle class. More candles means more fires while more gensets mean more air and noise pollution. Stories of “collusion” among big power companies are comparable to the “Trump-Russia collusion” hoax and dishonesty.